Before setting up your invoicing and stock control system you must decide whether you are going to rely on information from the computer to determine how stock is controlled, or whether you are going to allow operators to over-ride the system and issue stock on their own initiative. If you have a situation where stock updates from production or goods received are not carried out timeously, then you will need to allow operators to determine whether to draw down stock to negative quantities or to put orders on back order. NB when you make setting changes, please exit Exact and open the programme again to ensure that the setting changes have filtered through to all levels of operation. Also bear in mind that if you alter parameters such as not allowing negative stock items, these parameters may be over-ridden by processing documents that are already in the system and that the new parameters may only apply to newly generated documents. If you are happy that stock updates are timeous, then you can impose greater discipline and set the computer to disallow issuing of negative stock. You must also decide whether you are going to use full sales order processing or not. Full sales order processing is where you produce a picking slip, send it to stores for picking, and then return it to invoicing with a note of what can be supplied. The Invoicing operator may then decide whether to put the remaining goods on back-order or not. In this scenario the stock should be set to allow negative quantities because it is dispatch who decide whether stock is available or not. If you are not going to use full sales order processing, but are merely going to issue invoices, you may also decide to allow stock issues that will make the stock quantities negative, or not. Bear in mind that the operator can always see what the computer “thinks” the stock on hand quantities are, and can make decisions based on that information. The picking slip is returned and some items are not available. The order is recalled to generate the delivery note / invoice for those items that can be supplied. When the field for the quantity of an item that cannot be supplied is overtyped with a different quantity and the computer “thinks” there is insufficient stock, the following screen will appear. 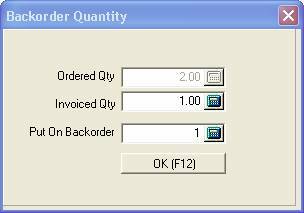 This shows the quantity of the original order for the item and the operator can decide whether or not to supply all or part of the item by entering an amount in the [Invoiced Qty] field, and decide whether or not to put some of the order onto back order by entering a figure into that field. The above screen may also be displayed by clicking on the <Backorder Qty> button at the lower left of the screen. When the invoice/delivery note is posted a new picking slip will be produced for the backorders. This would be where the invoice clerk produces delivery notes / invoices straight away upon getting an order. The operator produces an invoice / delivery note and attempts to add an item that is out of stock or where there is insufficient stock to supply the quantity entered. A screen appears similar to the one above, except that the operator can only determine whether to invoice a lesser quantity than possible. The system automatically adjusts the quantity on back order. If a situation arises where the customer has ordered, say 4 of an item, where only 2 are in stock, the system will attempt to put 2 on back order. If the customer says they do not want any on back order, then the backorder screen must be closed and the original order changed to 2 items. NB Allowing any sort of back-order function will over-ride the system setup that says that stock cannot be drawn down to negative quantities. If this picking slip is recalled to be invoiced, the assumption is that the slip has been vetted by dispatch who says that they can supply, even though the computer “thinks” there is no stock.